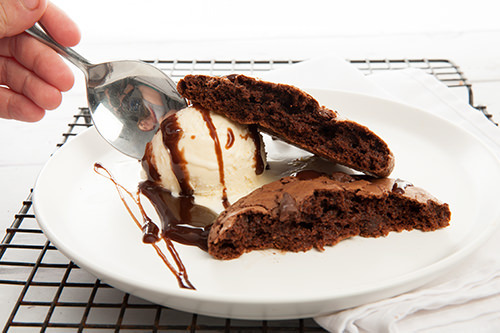 Masterchef is a source of cooking inspiration for me it’s what bought me baking this chocolate brookie recipe . The other night I watched as three contestants were asked to create a midnight snack for Nigella Lawson. One of the contestants made a Dark Chocolate Brookie served with a Frangelico cream. It looked amazing! I loved the way Nigella scooped a huge dollop of cream onto the chocolate brookie and devoured it. We discovered that a chocolate brookie was a cross between a cookie and a brownie. 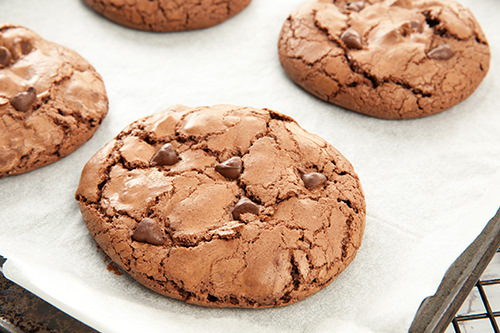 Hubby likes a soft cookie and loves chocolate, so this recipe had his name all over it. 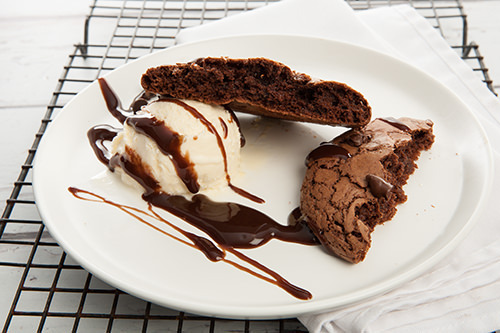 The texture of a Chocolate Brookie is crispy on the outside, and soft and gooey on the inside. Needless to say it has been on my mind to make Chocolate Brookies ever since the episode aired. I thought this would be a good recipe to adapt for the Thermomix, but you could easily make this dessert by melting chocolate in the microwave and using a stand mixer. The mixture makes about 20 Chocolate Brookies. Instead of making them all at once, I make six and refrigerate the rest of cookie batter. Place the block chocolate in pieces in the TM bowl to grate. 5sec/Speed 8. Remove chocolate and reserve in a small bowl. Add butter to the TM bowl. 3sec/speed 8. Heat the butter 1min/60degrees/ speed2. Add the reserved grated block chocolate 2min/60degree/reverse spoon1. Repeat until melted. Add the remaining ingredients to the TM bowl except the chocolate chips. 1min/speed.6. Scrap down the sides and repeat 1min/speed 6. Pour the cookie dough into a medium size bowl and stir through 1/2 the chocolate bits. Cover and refrigerate the dough for 1 hour minimum. Line a cookie slide with baking paper. Once the cookie dough is firm spoon tablespoons of the mixture on to the cookie slide. Leave space for spreading. I actually used an ice-cream scoop and then flattened the brookies down. Press the remaining chocolate chips onto the top of the Brookies. Bake for 13- 15 minutes. Remove from the oven to cool on the tray slightly before serving. *The Brookies won't look at all cooked when you take them out of the oven, they will have a delicate, macaron style shell that is easily crack when they are hot. As they cool they become a lot less fragile. 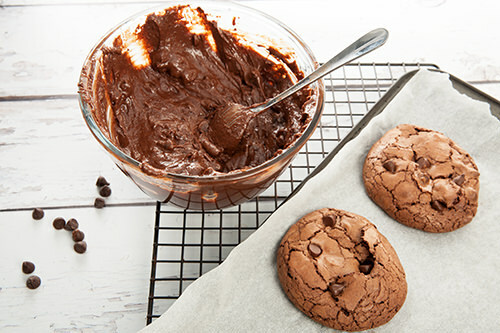 Add the block chocolate broken in pieces to a glass bowl with the butter, microwave in 1 minute bursts. Continue until the mixture is melted. Add the cornflour and remaining ingredients to the bowl, including 1/2 the chocolate chips. Beat the mixture by hand until well combined. Once the cookie dough is firm spoon tablespoons of the mixture on to the cookie slide. Leave space for spreading. 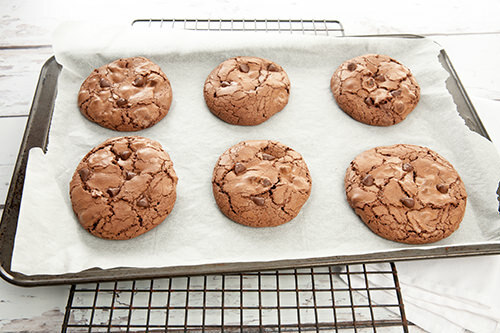 When the Thermomix Chocolate Brookies came out of the oven, they looked and smelled fabulous! That had the most gorgeous crinkled tops. I just wanted to break one open and dive right in. When they first came out of the oven, they’re quite delicate. I left them to cool slightly while I set up my camera gear ready for the mandatory photos. The mixture makes about 20 Chocolate Brookies. Instead of making them all at once, I made six and refrigerated the cookie batter. I figured this would make our night time Brookie treats quick and easy to make. Plus, we would be able to eat them hot, straight from the oven each night. 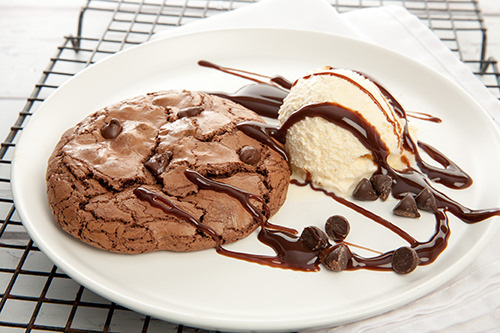 I served our Brookies with vanilla ice-cream and chocolate sauce. It was a very decadent treat. Take a look at the inside. When they first came out of the oven, I had to be careful not accidentally squash them. They were so incredibly fragile. Even when they are cold, they just melt in the mouth. I have to say a big thank you to Harry Foster, Masterchef contestant for his Dark Chocolate Brookie recipe. These chocolatey treats will be making a regular appearance in this household. 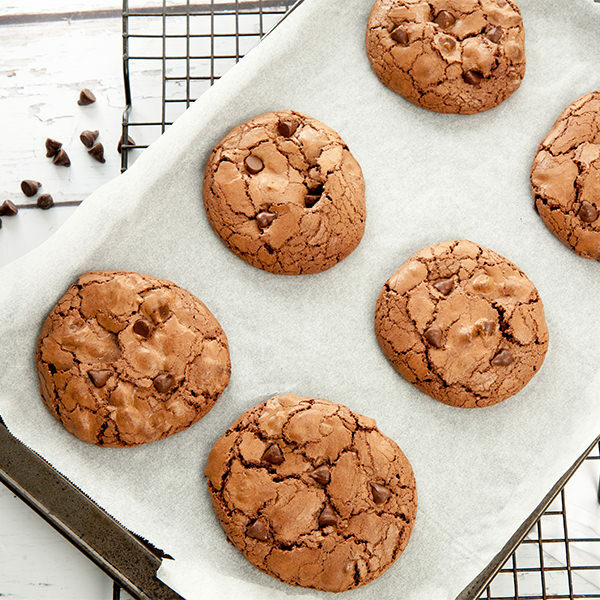 If you’re looking for more fabulous chocolate recipes, take a look here or check out our Malted Milo Cookies with Choc Chips.